Even when he was just a fresh-faced 19-year-old, nearly a decade before he would achieve both critical and financial success, Kanye West was already a standout talent. 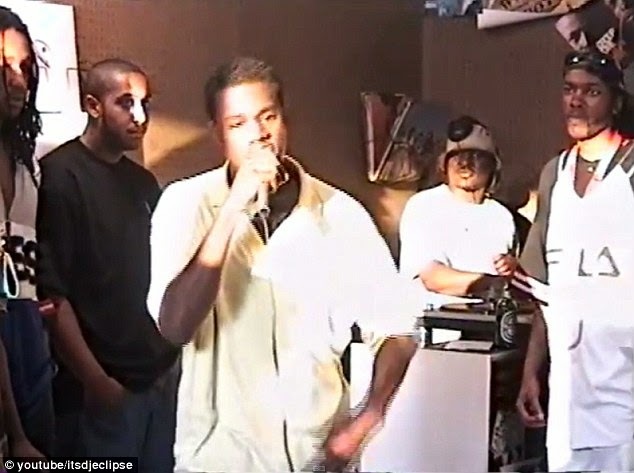 In newly released video footage, the now 37-year-old rapper can be seen freestyling at a record store opening in New York in 1996. And the Yeezus artist's lyrical skill is on full display in the clip as he manages to fit Alanis Morrisette into his flow with the very ease and panache that later made him famous. Kanye was eight years away from achieving both critical and financial success with his debut album The College Dropout in 2004 as he raps about his own rhyming skills. In the freestyle rant, the hip hop artist manages to reference not only Alanis but her then hit Isn't It Ironic, which had hit the top of the charts earlier that year in 1996. He also shows early signs of his signature bluster that would later make him the talk of the media with the line: 'It ain't original because I stole it from the future'. Meanwhile, Kanye has been commended by a Los Angeles court for his commitment to both his anger management classes and community service mandated by a deal cut in his recent battery case stemming from an incident with videographer Daniel Ramos. The Bound 2 singer, according to TMZ, has already completed 30 of his court ordered 240 hours of community service at a local technical college. The gossip website claims his community service supervisor has recognised his progress and cited him for 'an excellent display of work'. In addition Kanye is said to be 'performing excellently in his anger management courses, with nearly of half of his 24 sessions completed. The rapper has been in Europe performing on his Yeezus tour as his wife Kim Kardashian has been busy filming her reality show in the US. The couple share a daughter North, who turned one-years-old last month.